These are our customers. 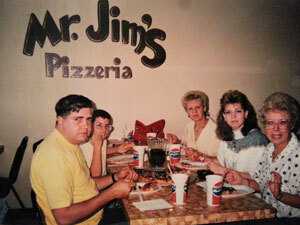 These are the people who made MrJims.Pizza what it is today. Without them we'd be nothing. I would like to post your photo enjoying MrJims.Pizza here. I want to hear your MrJims.Pizza story. Send me a note with your photo telling your story and I will post it here on the web. Did you work for MrJims.Pizza growing up? Did you meet me at some point? Let me hear your story. I don't know exactly how many photos we will use but let's see what happens with this page. Send me an email with your photo and story and, if it's interesting, I will publish it here. Well, I'm gonna take you way back with this story and photo. I'm gonna let you tell me when and where it was taken, after all, you took it. I will tell you that it was my senior prom, we were married about 2 years later and we are still happily married. We were on our way to the prom and we stopped by to pick up my paycheck. The picture was your idea. My wife didn't want a picture taken because she thought her braces made her smile ugly. You told her that her smile was as beautiful as ever and nothing could ever change that. That made her day. We have never forgotten. We now live about an hour from where the picture was taken. By the way, do you remember writing me a check for 1 million dollars and daring me to try to cash it? I'm pretty sure I still have it. What are my odds now? I'm gonna leave you with one last story. It is a story that can be told in 2 words. The "naked's". 'Nuff said! Dear MrJims.Pizza, I worked with Scott Hallman at his franchise in Mesquite...Town East and O Hare. Many years spent there during High School and early college. Thank you for giving me the love of food. I have been a chef now for almost 15 years with Marriott, and can't imagine doing anything else...thanks! In the picture from left to right: My father Daniel Tidwell, me Carlos Tidwell about 10-12yrs old, my grandmother visiting from Germany Lilly Thiel, my visiting sister from Germany Daniela Wagner, lastly my mother Ute Tidwell. Picture is somewhere between 1987-1989 in Ft. Worth, TX. 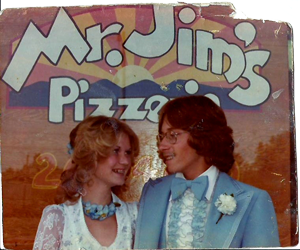 I grew up eating MrJims.Pizza in Ft. Worth, TX in the 80's. This was my first time in Houston once I discovered your location from your web site last week. Awesome as I remember when I was 12yrs old. Now 35yrs old. I've considered you all the best. 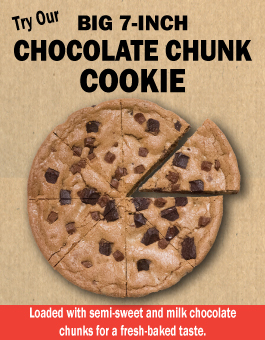 The others don't stand a chance, Papa Johns, Domino's, Pizza Hut etc.